Curry shot 8 for 12 from deep to pass Ray Allen (385) for career post-season 3s with 386, had a post-season career-high 15 rebounds, seven assists and the 31st 30-point post-season performance of his career. "To be in the same category and to pass a guy like Ray Allen and all the iconic moments he's had in playoff games and finals games, it's pretty surreal," Curry said. "Definitely honoured and grateful for those opportunities. I always joked, if I shoot a lot of 3s I better make a lot of them." 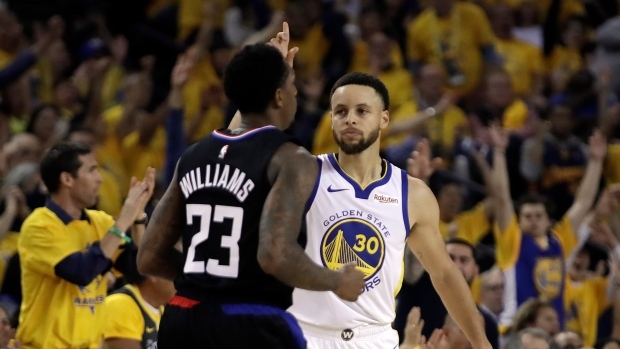 These teams are meeting for just the second time in the post-season after the Clippers took a seven-game series in the first round in 2014 when the California franchises had a deep dislike for each other. Draymond Green got Golden State going by making all five of his shots in the first quarter on the way to 17 points to go with seven assists and seven rebounds, while Durant scored 23 points as the Warriors ran their post-season winning streak to seven games. Warriors: Curry notched his fifth career double-digit post-season rebounding game. ... Durant (3,679) passed Dirk Nowitzki (3,663) for 15th place on the career playoff scoring list. ... The Warriors have won seven straight post-season Game 1s and 14 of 15 openers in all — going 16-1 in their first game of a series dating to the 2014-15 season.